Draculaura's turning sweet 1600, and she's going batty preparing for a graveyard party! 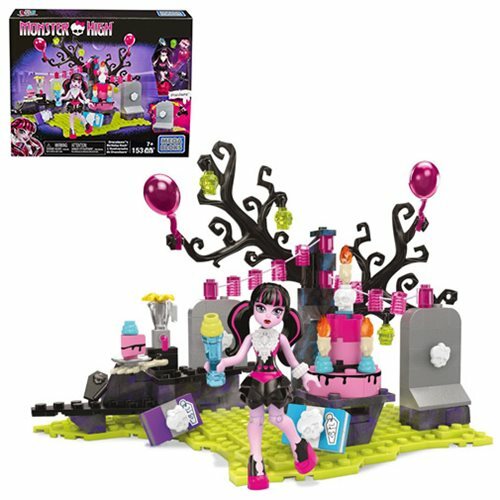 Build the Mega Bloks Monster High Draculaura Birthday Bash Playset and help her get ready when you decorate the graveyard with lanterns, balloons, and party favors. Then, get this fang-tastic celebration under way with presents and a cake for Draculaura. Spin her cake to skelebrate, and surprise Draculaura with a special guest - her pet bat, Count Fabulous, hiding behind the tombstone! 153 pieces. Ages 7 and up.